Time to raise smoking age to 21? There is a growing clamour to raise the age at which tobacco products can be bought, from 18 to 21. The All Party Parliamentary Group on Smoking and Health put forward the idea earlier this month, and now a leading doctor, Imperial College London respiratory specialist Dr Nicholas Hopkinson, has written in the British Medical Journal arguing the case for the change. Helping existing smokers to quit is important, says Dr Hopkinson, who also chairs the Action on Smoking and Health campaign group, but "the most vital element" is to prevent young people from starting in the first place. "Smoking is a contagious habit, transmitted within peer groups," he says. To back of his case, he points to the success of raising the legal age from 16 to 18, which happened in 2007. 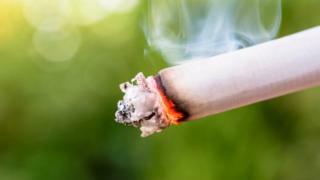 Since then, the proportion of young smokers - defined as those aged 16 to 24 - has fallen from more than one in four in 2007 to less than one in five now, according to the Office for National Statistics. What is behind the falling smoking rates? But of course it is impossible to say whether that is directly linked to changing the age at which tobacco products can be bought. All have had a role in the overall decline in smoking. But another factor - some argue even more important than any legislation that has been introduced - has been the rise in e-cigarettes use. Data from the ONS suggests nearly a third of ex-smokers have been or still are vapers. Public Health England says e-cigarettes are now the most common quit aid and are helping give the nation a "fighting chance" to become smoke-free - classed as having less than 5% of people smoking. It is why the government's annual Stoptober campaign has embraced e-cigarettes. Currently, ministers in England says there are no plans to raise the age at which people can buy tobacco products. The Department of Health and Social Care published its last smoking strategy in 2017. But that will not stop the debate raging. Research suggests two-thirds of smokers take up the habit in their teenage years. Campaigners believe by closing the door on this older teenage market they can deal a fatal blow to the tobacco industry. But raising the age at which people can buy tobacco products is not the only frontier the health lobby is pushing. But even as arguments over what to do next on smoking develop, don't forget there could be another factor in all this - the impact of "Generation Sensible". All the evidence suggests young people are increasingly shunning the unhealthy behaviours of previous generations. Not only are they less likely to smoke, they drink less, take drugs less and socialise less. The reason? Research suggests they have exchanged the traditional vices for social media and gaming. Could that be the thing that stubs out smoking? Reality Check: Who gets social care and who pays for it? Reality Check: Is social care getting more money? What's the cost of care in your area?